Readers will know that Theodor Seuss Geisel, AKA “Dr. Seuss,” worked in other forms than the books for which he was most famous– readers will remember his (in both senses of the word) fabulous The 5,000 Fingers of Dr. T, and pre-blog readers will recall his work as an editorial cartoonist during World War II. 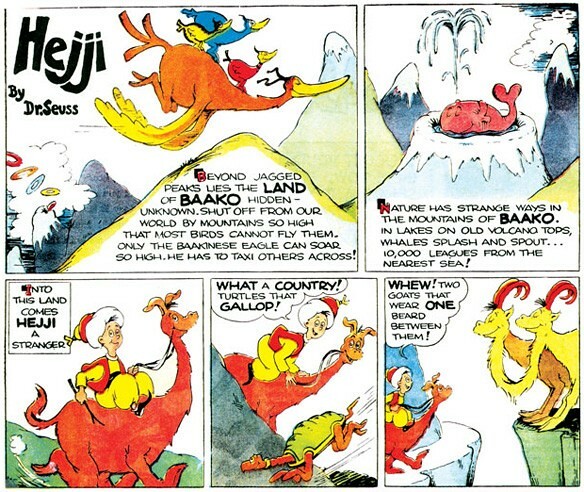 Hejji, which ran for under a year in 1935, told the story of a traveler who found himself in the strange land of Baako, a mountaintop country that’s equal parts Tibet, the Middle East, and Whoville… Heijji’s adventures prefigure several of the good Dr.’s classics-to-come– and delight in their own right. Explore them further in Chris Sim’s lovely tribute at ComicsAlliance. 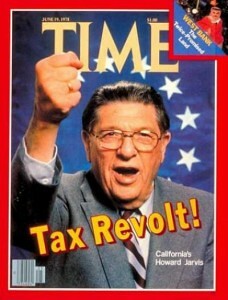 As we rethink our position on green eggs and ham, we might recall that it was on this date in 1978 that California voters approved Proposition 13, rolling back property taxes to 1975 levels and capping increases to a 2% inflation factor. Since then California public schools, which had been ranked among the nation’s best, have declined to 48th (in surveys of student achievement).